Woo-Hoo!! It's time for the Waltzingmouse November SOAP (Stamp of Approval Parade) parade!! This month, we're focusing on anything Christmas. Whether it be a card or project. Today, I have two sweet little handmade bags to share with you, using a couple of the new Waltzingmouse sets Seasonal Remedies and Candy Jar Christmas. The first bag is made out of kraft paper, and the second made out of felt. 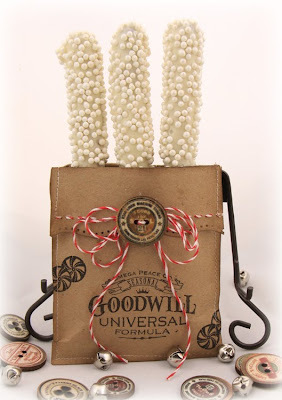 I'm more of a paper-crafter than a cook or baker, but these white chocolate covered pretzel rods are super easy. Even for the clutziest of people. I'll include the easy recipe at the bottom of this post. The bag is super easy and quick to put together. I started off with 2 pieces of 3 1/2" x 5 1/2" kraft paper that I cut from a roll that I use to wrap Christmas gifts with. If you don't have kraft paper, you can use lunch sacks. Kraft cardstock is too thick. I then stamped the design I wanted toward the bottom of one of the pieces, and punched one end, of both pieces, with a decorative punch. (the opposite, and back side of the stamped image - because you're going to fold it over.) I start my punch in the middle, and work out. That way the punched border is balanced. After punching, measure 4" in from the un-punched edge and score with the image facing up. I inked the fold so you can see it better. This is what it's going to look like when folded. Next, you're going to want to sew the two pieces together. Lift up the flaps and sew from one side of the opening around the bottom and to the other side (not including the flaps. Back-stitch along the top edges so they are secure when adding the Chocolate dipped pretzels) Then sew the edges of the flaps individually if you want. If you sew them with the rest, they don't lay as nice. Here you can see the sewn edges. Then when you fold the flaps, they're not so flat. Lastly, I added some twine to the punched border and a sweet little vintage wood spool button by Prima. 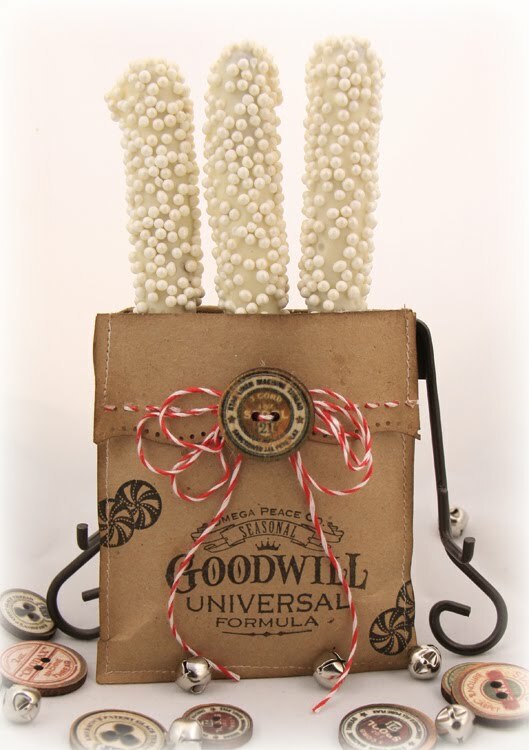 For this set, I included pretzels all decorated with white chocolate and candy pearls. You can also use Felt to make the bag. I would cover the pretzels with cellophane, though, because you don't want them against the felt. I also sewed the sides all the way to the top because felt is easy to fold over. Lastly, I added some twine with a couple of jingle bells on the ends, and a diecut border that I made with the Classic Petal Edgeabilities die by Spellbinders. 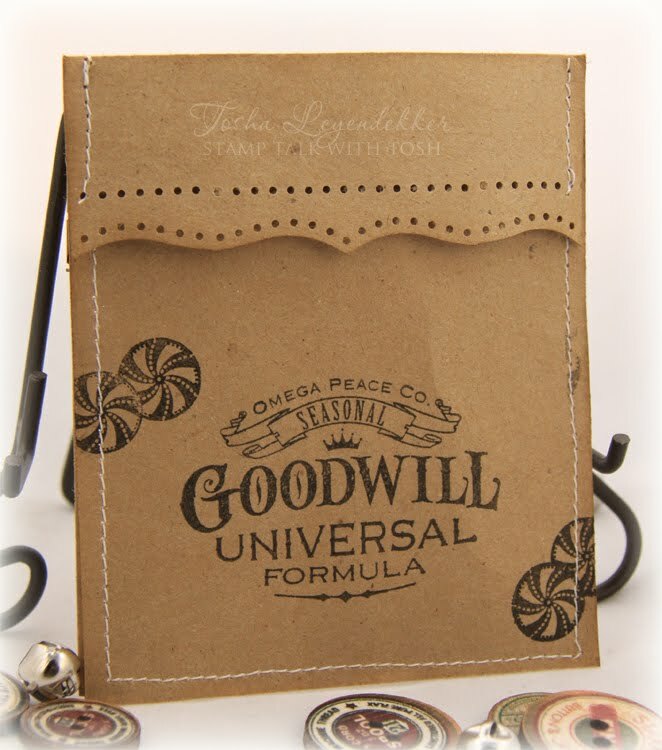 This little bag would be great as a place card with the name of a guest added on a little tag. 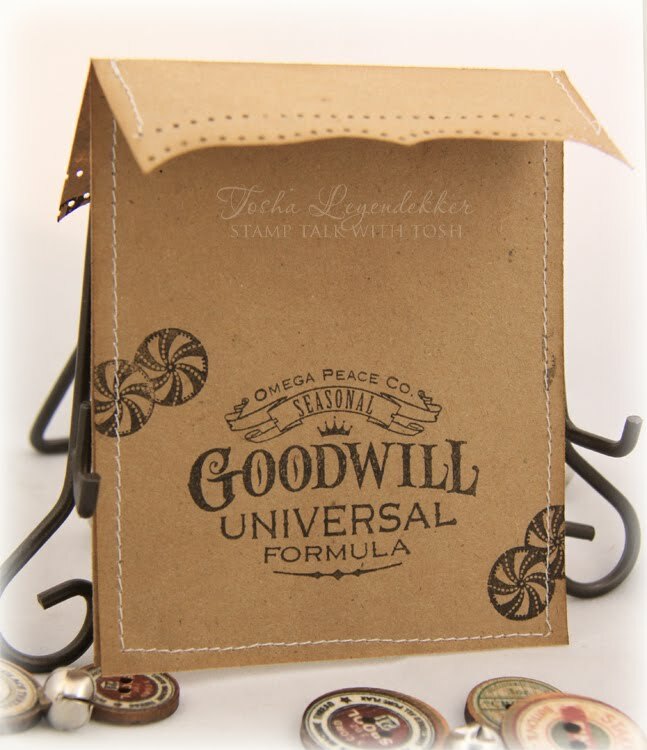 It would also be sweet to give as a gift to your classmates, a teacher, or whatever that creative mind of yours can come up with. That's it for today's project. Be sure to check out what the other girls have to share, if you haven't already. Heat in mug or microwave safe bowl for 1 min. and 30 seconds at 50% power, stir, and continue heating in 15 sec. intervals until completely melted. Dip pretzels in and let the chocolate drip off. You want a thin layer of the chocolate. While still wet, sprinkle whatever topping you'd like over the top. I laid mine over a mug so the frosted side hung over the edge while drying. 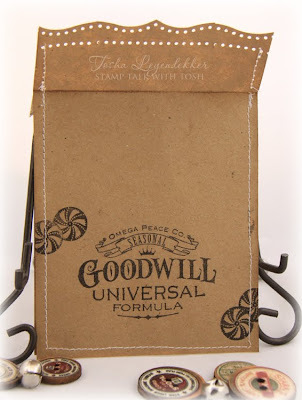 WOW, these are 5 & Dime perfection, Tosh!...So charming and rustic. They make me think of the Olson's Mercantile from Little House on the Prairie (is that right?? :)) Love the black stamping, perfect for your labels, ohhh and the twine wrap! Thanks so much for sharing your recipes, both for the pretzels and the bag! I just LOVE your little satchel and the fun pretzel treats inside Tosh! what a wonderful gift idea - thanks for sharing how you made this lovely creation!! Wow, you bowl me over - they are both totally gorgeous, but especially love the little felt version-so Christmassy and the little jingle bells on the end of the twine is such a sweet detail. And a recipe too!! Yay!! I really LOVE these! The felt one is really special. Pretzels and chocolate are my FAVE!! Tosh, your projects are beautiful. That little felt bag is precious! Love these little bags - really sweet projects! What a lovely gift for someone!!! I may have to try some chocolate covered pretzels too!! Fabulous idea and I love that you showed how great they look in so many different fabrics/mediums. Awesome job. This is a great little project...love it...and love the word clutziest (or however you spelt it!!) I think I can imagine what you mean but hey, Claire, it could almost be Irish, couldn't it? Clutziest...wonderful...I'm going to adopt that! Anyhow you did a great job! these are beautiful Tosh! 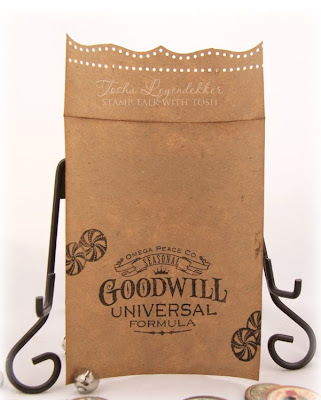 love the shape of these bags...and your stamping is perfect! Absolutely brilliant!! You take bags to another level Tosha! These are as sweet as the goodies inside! that is the cutest..thanks for sharing Tosh! Thanks for sharing the tutorial for these awesome gift bags! 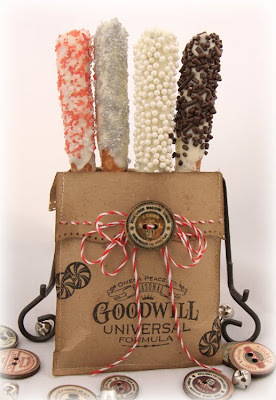 The chocolate dipped pretzels sound like a quick and easy treat to make! I know you loved seeing your kids again and know they were thrilled you flew out to see them! 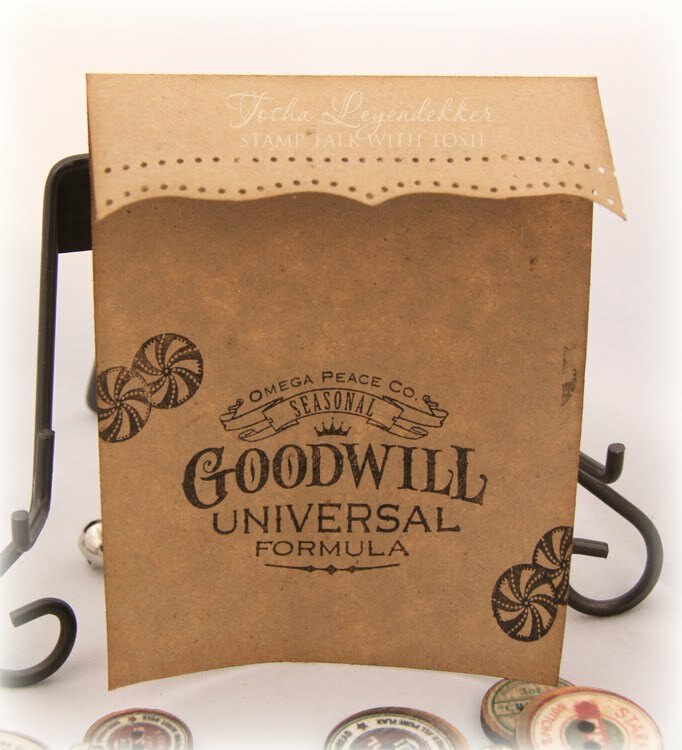 these bags are too cute, love the stamping and that neat wooden button, great presentation for the gift! I bet it was great seeing the kids, hope they are having a good year so far! I love it!!! What a treasure... am thinking of making these! OMGoodness, how fun! This is such a cool idea and a fabulous look! Cute *and* scrumptious! I love this little treat bag, Tosh! 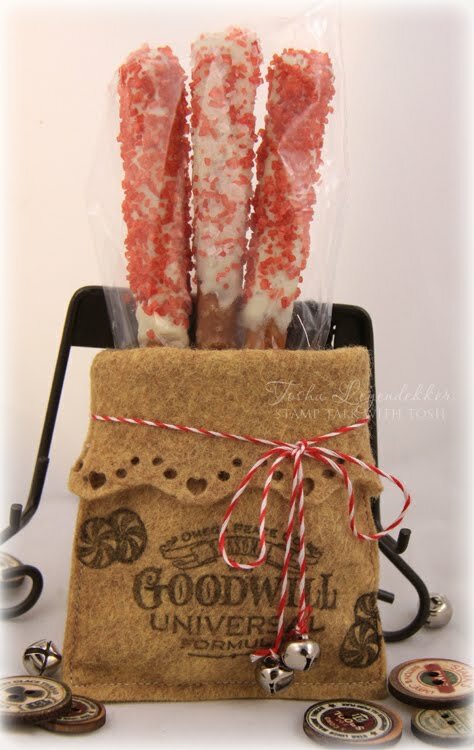 The pretzels look seriously yummy in them, but just imagine the possibilities! Thanks for the great idea! Tosh, your bags look pretty, both in kraft and felt. And the goodies inside look very yummy. What a fabulous idea!! I love this!! Your bags look wonderful, and so pretty & functional too. Great job!! 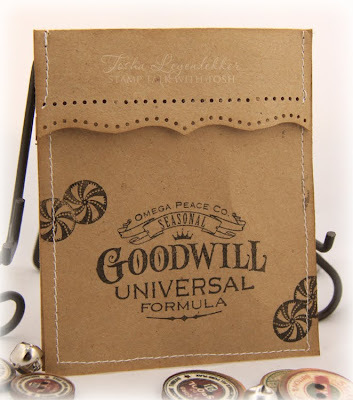 I just love the way your little bags turned out...so vintage indeed.